Top aide to North Korean leader will reportedly meet Trump and Pompeo in Washington on Friday. 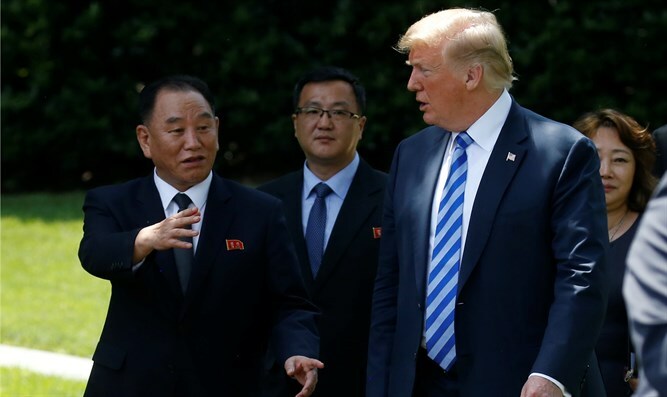 A top North Korean official is set to meet US President Donald Trump and Secretary of State Mike Pompeo in Washington later this week, four people familiar with the matter told Bloomberg News on Wednesday. Kim Yong Chol, a top aide to North Korean leader Kim Jong Un, is scheduled to be in Washington Friday as part of negotiations over the country’s nuclear program, according to three of the people, who asked not to be identified discussing private deliberations. Trump and the North Korean leader held a historic summit in Singapore last June, during which they signed an agreement which includes a commitment to achieve total denuclearization of Korea, with promises to pursue “vigorous negotiations” to that end. Pompeo was supposed to meet with Kim Yong Chol in New York in November, but the meeting was abruptly cancelled, and the US explained it was the North Korean side which postponed it because they were not ready. Despite the stalled negotiations, Trump has remained optimistic that a second summit with the North Korean leader will take place. The President said earlier this month that Kim had sent him a “great letter” and added, "We really established a very good relationship. We'll probably have another meeting." Later, Trump said that the US and North Korea are negotiating the location of their next summit. The US insists that United Nations sanctions must remain in place until North Korea gives up its weapons, while Pyongyang wants them immediately eased.